Summer may be coming to a close but if you are like Kyle and I, you will take advantage of every nice evening to grill out! I was trying to figure out a yummy dessert option to close out a great dinner we had recently and I decided to grill up some fruit. We have a little peach stand down the street from us where this really nice grandma and grandpa bring peaches up from South Carolina. They are delicious on their own but I decided, for a bit of flair, to marinate them in honey, lime juice and, in some of them, a splash of port. I also marinated fresh pineapple in another dish because I thought the flavors would pair well with pineapple too. 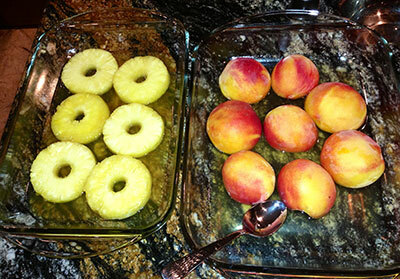 First, I got a large glass dish and sliced up the pineapple into rings and removed the pits from the peaches and halved them. Next, I took honey enough to thickly coat the whole dish and then squeezed in a full lime. Now the port was an after thought. I am like an old man and I love port. My dad and I were having a glass during our cookout so I thought, ‘hey, I bet that would taste good with the marinating fruit too!’ I made a couple to try on my own and I thought they were delicious! I think a flavored brandy would work well too but if you don’t want to add any liquor,the fruit with just the honey and lime was delicious. 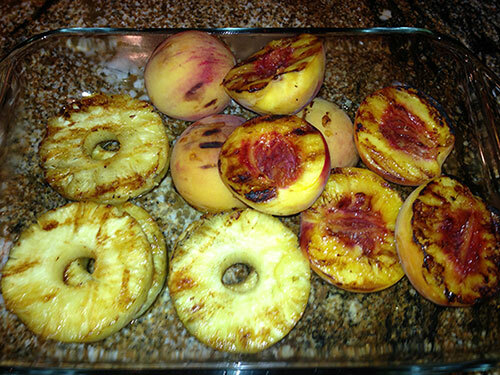 After marinating the fruit for an hour, flipping them over every fifteen minutes, I tossed them onto the grill set at medium and grilled them until each side had nice dark grill marks on them. 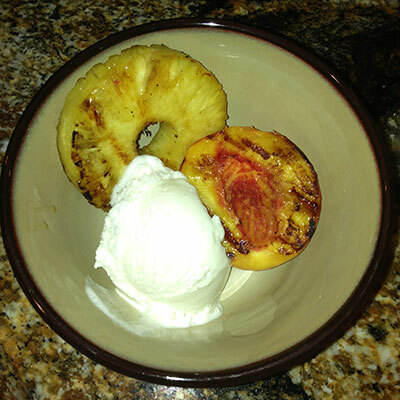 Once cooked, I placed half a peach, a pineapple ring and a scoop of fat free vanilla bean frozen yogurt into a bowl. We served it just like this but the next time I make it, I think I will drizzle honey on top and add granola for a bit of crunch. Enjoy and let me know your thoughts in the comment section below, thanks!